Tan & Flash Cruise features six shades of bold blush and radiant sculpting powder. It includes matte bright pink, satin electric coral, satin cool fuchsia, matte sandy beige, satin deep tan, and satin peachy tan. Design a sun-kissed summer glow—no matter your skin tone—with skin-enhancing shades of blush, bronzer, and highlighter. Decadently silky with satin and matte finishes, these blendable powders make it easy to sculpt your contours, brighten your features, and create a healthy, natural tan. You may not be able to take a tropical vacation—but you can look like you did. Use your favorite makeup brush to sweep the shades along your cheekbones, jawline, temples, and anywhere else you want to accentuate or add a warm radiance. I own a lot of makeup, I mean a lot. I could probably open my own boutique. But this is by far, the most breathtaking piece that I own. But the beauty doesn't stop at the looks, these powders are so soft to look at and touch, they're almost fabric like, and so incredibly pigmented. I had to swatch them and it took me a really long time to do so, because I didn't want to mar the beauty of the palette, but when I did wow. All the colours swatch well, and only a small amount is needed for full on colour which is good because it's not the largest palette. The three blush shades compliment my golden brown skin tone perfectly, which was a bit of a surprise as I was fully prepared to write that bottom shade off as a loss, but they're a lot warmer in person than they look online. The middle bronzing shade is a perfect match, with some slight gold shimmer, and that peach highlighter is everything. All of the shades have a slight shimmer but it's very light so even if you dislike shimmer, I don't see it being a real problem. This is so well worth the money, and I'm so obsessed that I want to get the other one even though I know it will do nothing for my complexion, I just want to own it! This is like the coolest toy for grown up girls. I love it all! The shades, oh the many shades! This palette is even fun to look at, I adore it. You get so much for the money, you really do. There's something so great about the way these shades wear. They are all flattering with the best finish. The highlighters are not disco-y and the bronzers are not orange-y.. just seamless beautiful color. I feel like I got away with something here, usually in a palette there is a shade or 2 that doesn't get used or it doesn't work, not the case here. This palette really is the HG of creamy powder sculpting kits. So great, so pretty I CANT STOP PLAYING! I need to order another for my stash. *a light-medium tender hint-of-peach pink with a very fine pearly sheen for a softly luminous finish. *a medium golden brown with a very fine golden shimmer. I got it right when I said that the more you blend these out, the more burnished and glowing the finishes become. *I have a friend whose surname is "Roseberry." There is a shade here which has his name written all over it: it's a lush medium-dark "roseberry" with a satin finish. It's highly pigmented and, while it blends out easily, it retains that color intensity, so for those with lighter skin, use sparingly. This is one of those universal skin-tone flatterers. *a light, creamy peachy-beige with a satin finish. Strange to say with such a light color, but it has strong pigmentation and affords a lot of coverage. It's very beautiful; reminds me of the ELLIS FAAS "Glow Up" powders with less light-reflectivity. Have to go to Ellis Faas for that! No problem! He's right here! *a beautiful terra cotta shade ... a muted, medium-dark reddish brown with a semi-matte finish. Okay, more than enough said. 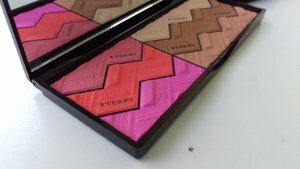 I snatched one of the ALL NEW By Terry Sun Designer Palettes yesterday, in Madrid, just before boarding a return flight to California. They were quite literally just beginning to stock the shelves there. I believe that the two latest and greatest Sun Designer Palettes are currently available in the old U.S. of A. exclusively @ Beautylish. For clarification, there are now 4 palettes: the original #1 Tan & Flash Cruise and #2 Light & Tan Vibes ... and now #3 Tropical Sunset and #4 Savannah Love. For reference, I have already burned through two Light & Tan Vibes and I believe that if you're drawn to that palette, you will also be drawn to the beautiful new #4 Savannah Love. It's a different palette, for sure, but if any of the following phrases resonate with you, Savannah love is destined to become one of your new loves. Think, soft warm pinks, rosy tans & golden peaches, and you have a feel for the lighter shades. Think, golden browns, reddish browns & lush warm roses and you have a feel for the deeper shades. Finishes range from semi-matte to satin to pearly sheen ... no over the top frosties. Also, these powders have the same interesting property I noticed in the earlier palettes: the more you blend out a color, the more glowing the finish becomes. So you can just buff, buff, buff your way to a more burnished, more lustrous, you! Now I have to order a couple of the new SELF-SHARPENING Stylo Blackstars. I'm an absolute Ombre Blackstar junkie. Like another reviewer said, this is THE most beautiful piece of makeup I own (more than Guerlain Meteorites, Tom Ford shadows, etc). The packaging, the design, and the colors are just ridiculous. If you think the pictures you've seen are gorgeous, then you will be stunned if you see it in real life. This is one of those rare instances when even the best photos I've seen on blogs do not do this justice. I purchased the Light and Tan vibes because I felt it suits my skin tone more, and I may actually have to purchase a backup of it. I needed a new blush and bronzer. I had purchased the Guerlain 4 seasons bronzer and loved it, but I returned it once I got this. The shades on the left are the most beautiful blush and highlights. I use a Wayne Goss brush to apply and it can pick up each color individually or I can swirl together. The bronze shades on the left are perfect for the entire year. I love that I have everything I need in one palette. This is just exceptionally well done, from the design to the colors to the texture and longevity. I cannot rave enough! I bought two of them and try them today. 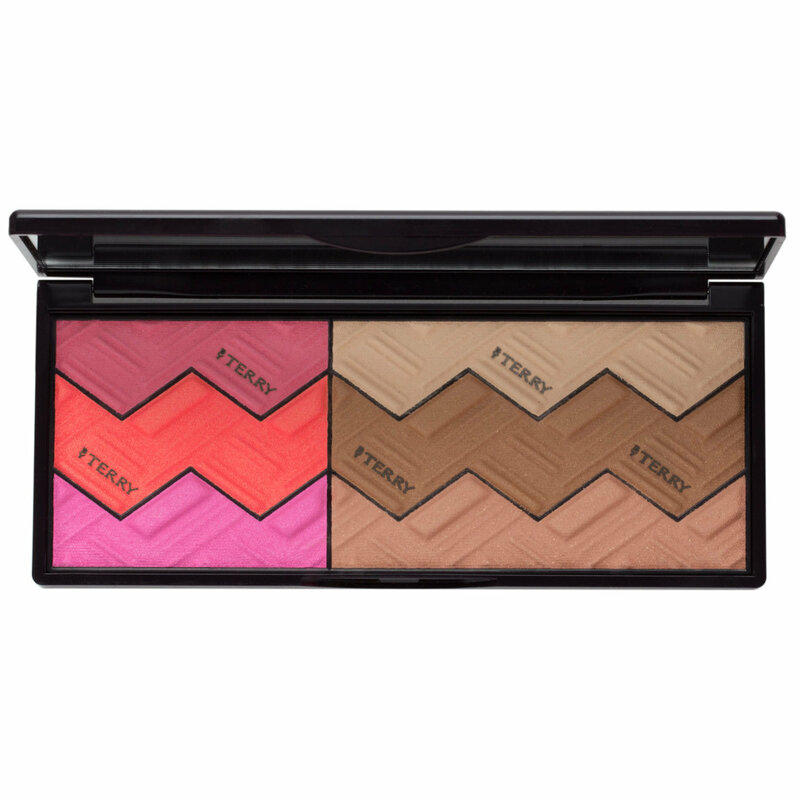 I love BY TERRY so much and this palette will be the best product for BY TERRY product line starter. 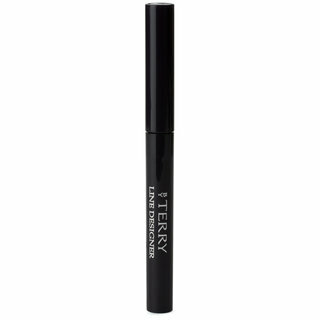 Really easy to apply, great pigmented but not chunky. The texture is surprising me, it's incredibly soft. If you are searching for a palette with blush, highlighter and bronzer, it is the best one. Also, really good for travel. WOW... I read a review that this palette was too powdery and is not a must buy. Then I saw another blogger's beautiful pictures of the swatches of this palette and I caved. I am so glad I got it! It is so pretty on the skin. I have dry mature skin, some blush powders accentuates my fine lines but not this powder. It is the most beautiful combination of colors. It is so pigmented that I barely sweep my brush across it to pick up the products thus I did not experience any "powdery" effect. I have experienced hits and misses with this brand but this palette is a big HIT. Get it, you won't be sorry. You will LOVE it. Incredibly Special and rare Palette! I feel like every once in awhile a brand comes out with something that works for all of us and in the case of this palette is exceptional quality at the right price. The minute I laid eyes on the light tan vibes palette I was a fan and couldn't wait to try it out. The bronzer is a beautiful neutral tone that is perfect for fair-light skin tones and the blush highlight shade leaves you with several natural and breath taking cheek options. And for my friends in the medium-deep skin tone range you're not left out either! The tan and flash cruise palette is rich, pigmented and will kiss your face with the perfect summer glow. You will have fun blending shades together, using them separately and creating eye looks to coordinate with your cheeks! My bags are packed and I am ready to chase summer with this palette as a staple for all my faux sun drenched makeup looks. I buy a sun designer palette every spring as soon as they come out. The quality is amazing, buttery soft and blends like a dream. The color choices are always spot on and the presentation so amazing beautiful. This season’s palettes are some of her best yet. I got Happy Sun and it’s the perfect combo of bronzed neutrals. 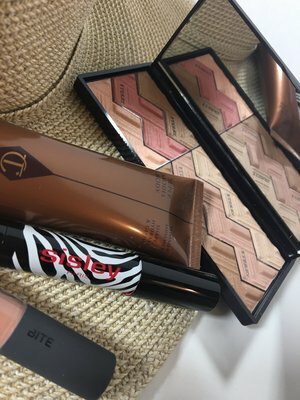 It’s so multifunctional as well - i use the palette for bronzing, blushing, highlighting, and shadow. Everything goes together seamlessly and you can create so many looks with just this palette alone. And I’m soooo excited the price of these have come down as well! 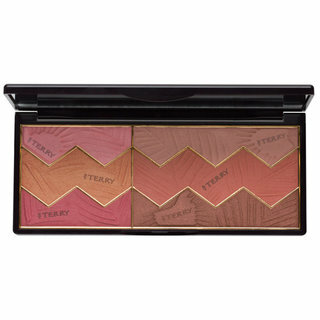 I LOVE this product and just purchased my second Light/Tan vibes SD palette...great color payoff, high quality as is with anything By Terry. However...my only qualm is the packaging. It's a tad cheap IMO. For color reference I am shades Kevyn Aucoin SSE shades sx08 and 10, Y405 (153 Golden Honey)in MUFE and nc37/40 in Mac terms. Medium golden/olive skin tone.